Use TB2X8QK to reference this item. Motorcycles and bicycles can be hard to see. 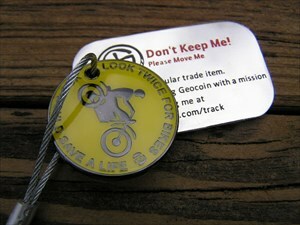 This coin wants to travel far and wide to spread the biker awareness message of Look Twice for Bikes! Sorry to say, did not see this trackable in the cache, Junction U.S. Route 395 and Hwy 17. Hope it shows up soon. Picked up from nowheresville OR. Will move to somewheresville WA. My brother was in a terrible motorcycle accident exactly for that reason. The car didn't see him coming. Be careful bikers, and auto drivers stay motorcycle aware. Nice TB. Moving it to another cache. TFTGC. Discovered this while on my UT to NH driving odyssey. Found another Todie TB along the way as well! Thanks!